Snrky: Does this mean we don't have to support your desktop configuration anymore? Does this mean we don't have to support your desktop configuration anymore? Inspired both by my getting more in depth with building an adaptive web application, which is rather complex for a relatively simple set of ideas, I couldn't help but poke some fun at the notoriously slooooow progress of many corporate desktop standards. With good reason of course*, but slow nonetheless. If you're interested in some more hands on info about who created the concept, or what goes into creating responsive web design, check out this presentation. * - in most cases. 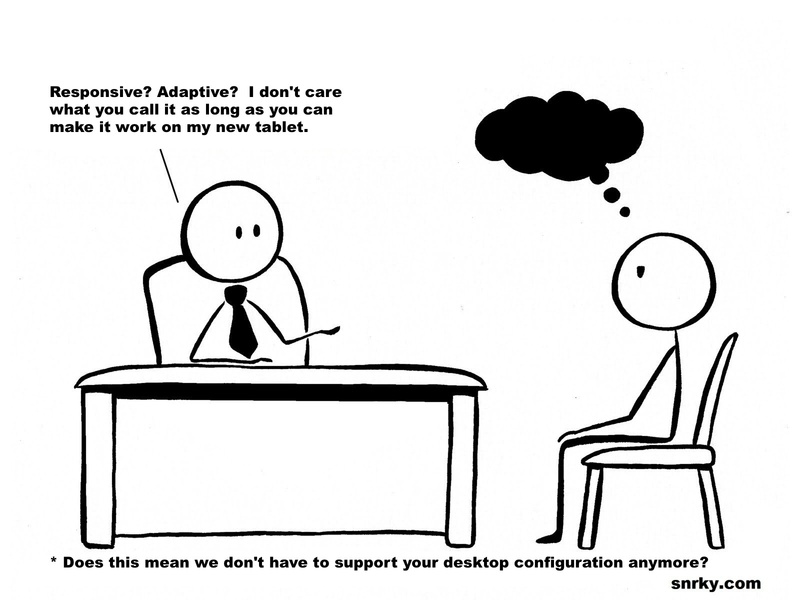 Snarky: Does this mean we don't have to support your desktop configuration anymore? make it work on my new tablet.